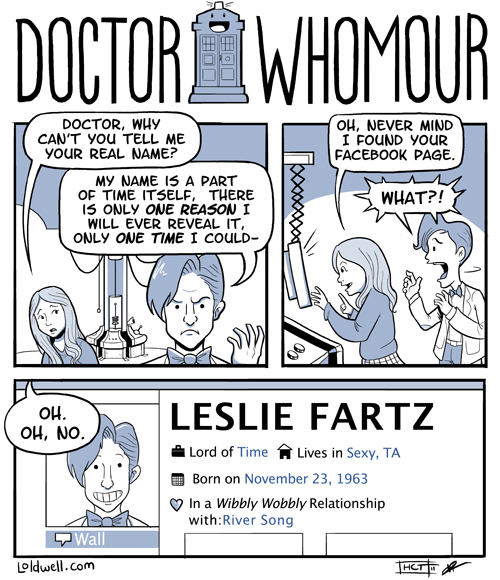 This entire strip was just an excuse to use the word “whomour,” a word which was devised roughly a year ago by my friend, colleague and fellow Whovian Tom Philip. Tom also wrote the script for this comic and we both agree it is the proudest fart joke either of us have ever made. Anyway, give it a listen here, and be sure to rate and subscribe us on iTunes! Thanks for catching that! It should be fixed now. Aha, mega lovin’ for this. Hey! Someone in my Myspace group shared this site with us so I came to check it out. I’m definitely loving the information. I’m book-marking and will be tweeting this to my followers! Exceptional blog and excellent design and style. Fun fact: That’s the day the first episode of doctor who aired! So glad to hear that! Allons-y! So glad it’s back on! LOL I love how there is the actual thing in the form of an ad right next to this while i am reading it.